Preheat oven to 300°F. Line baking sheets with parchment paper. In a large bowl, combine the almond meal, cinnamon and lemon zest with a whisk. Whip egg whites until they hold soft peaks. Continue whipping and gradually add sifted confectioner’s sugar. Whites should be thick, creamy, and somewhat stiff. Set aside 2/3 cup of mixture for tops of cookies. Gently fold egg mixture into almond mixture. Dough will be stiff. Lay a sheet of parchment paper or waxed paper on a flat work surface. Spoon dough onto paper. Flatten dough with your hands and lightly sprinkle with confectioners’ sugar. Cover dough with another sheet of paper. Roll dough between papers to 1/4-inch thickness. Flip dough over. Gently peel off the top sheet of paper. Sprinkle on a little confectioner’s sugar, place the paper back onto the dough and flip again. Peel other sheet of paper so that the dough is not stuck to either sheet of paper. 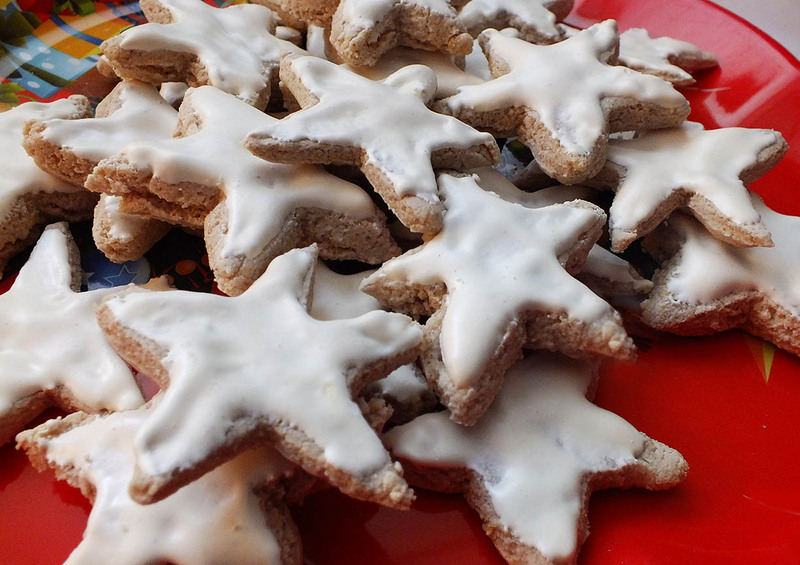 Using a 3-inch star-shaped cookie cutter, cut out cookies and place on prepared baking sheets. Dip cutter in confectioner’s sugar to keep dough from sticking to cutter. Gather and reroll dough as needed. Use a small metal spatula or small spoon to spread remaining meringue mixture over the top of each cookie. Don’t allow the meringue to drip over the sides. Bake 15 minutes. Let cool and store in airtight containers. Layer in containers carefully so as not to crush cookies.